Modern yet simple, the Wireware collection is designed with soft frosted white plastic inserts nestled into a chrome wire outer shell. This 5pcs set include a lotion pump, a toothbursh holder, a soap dish, a tumbler and a wastebasket. The set will add a contemporary spa like feel to your bathroom setting and are a perfect complement to any décor. Lotion Pump: The Wireware Lotion Bottle features soft frosted white plastic inserts nestled into a chrome wire outer shell. Combine with other accessories in the set will add a contemporary spa like feel to your bathroom setting and are a perfect complement to any décor.Measuring: L 3.18" x W 3.18" x H 6.49", Holds up to 8.45 oz. of liquid soap or lotion.100% Plastic/Metal Wire. Toothbrush Holder: The Wireware Toothbrush Holder features soft frosted white plastic inserts nestled into a chrome wire outer shell. Combine with other accessories in the set will add a contemporary spa like feel to your bathroom setting and are a perfect complement to any décor.Measuring L 3.18" x W 3.18" x H 4.48".100% Plastic/Metal Wire. Soap Dish: The Wireware Soap Dish features soft frosted white plastic inserts nestled into a chrome wire outer shell. Combine with other accessories in the set will add a contemporary spa like feel to your bathroom setting and are a perfect complement to any décor.Measuring: L 5.78" x W 4.01" x H 1.69".100% Plastic/Metal Wire. Tumbler: The Wireware Tumbler features soft frosted white plastic inserts nestled into a chrome wire outer shell. Combine with other accessories in the set will add a contemporary spa like feel to your bathroom setting and are a perfect complement to any décor.Measuring:L 3.18" x W 3.18" x H 3.74".100% Plastic/Metal Wire. 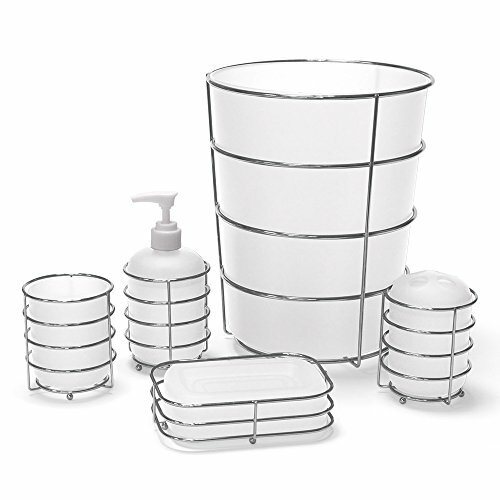 Wastebasket: The Wireware Wastebasket features soft frosted white plastic inserts nestled into a chrome wire outer shell. Combine with other accessories in the set will add a contemporary spa like feel to your bathroom setting and are a perfect complement to any décor.Measuring:L 8.30" x W 8.30" x H 10.35".100% Plastic/Metal Wire. If you have any questions about this product by Allure Home Creations, contact us by completing and submitting the form below. If you are looking for a specif part number, please include it with your message.